The Tooth Fairy visits Mr 5 for the first time! Over the last few weeks of January, I spent some time planning ahead for our homeschool year as Mr 7 finishes Grade 1 material and moves into Grade 2 material mid way through the year, and Mr 5 begins his 6 yo Kindergarten (or Prep as it is known here). For Mr 7, we will continue to use a number of curriculum resources, drawing from material from Earthschooling, Oak Meadow, Waldorf Essentials and free online sources. As he moves into Grade 2, we will draw on some of the Christopherus Grade 2 'Saints and Heros' material. A really good summary of resources can be found for Grade 1 <here> and Grade 2 <here>. 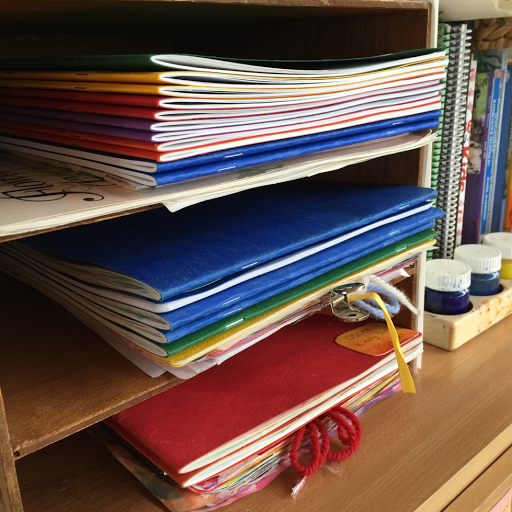 This year Mr 5 turns 6, and so it marks the first year of registered homeschooling for him. 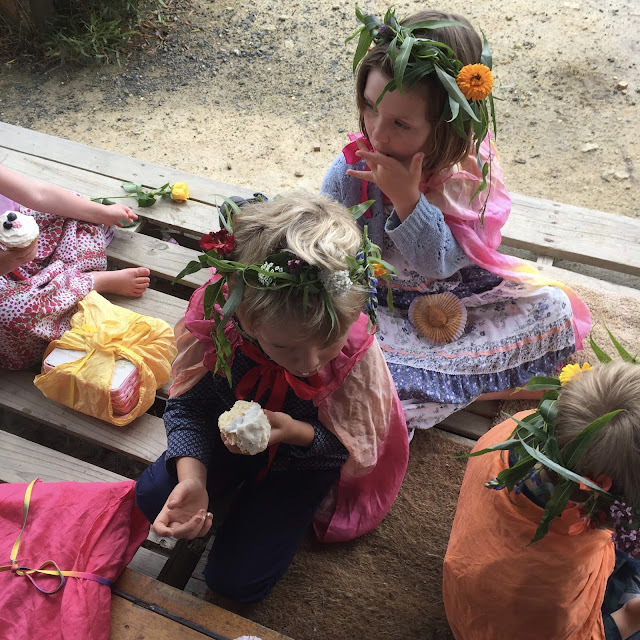 Using the Australian Steiner Curriculum Framework, his Kindergarten year will still focus on oral and aural work, stories, movement, play based learning, handwork, artwork and the natural rhythms of the home, family, festivals and the seasons, rather than formal academic work. We will be using some material from the Lavenders Blue 6 year old Kindergarten Curriculum, as well as Waldorf Essentials and Earthschooling. As he is present for his older brother's lessons, I find he absorbs much of the work that way too. It will be interesting to accomodate 2 home-schoolers into our week in a more formal way, making time for Mr 5's 'work'. I'm certain our daily rhythm will need adjusting and tweaking here and there as we work out how our days run most smoothly. From the tree to you! ~ Tuesday will be spent gathering with a lovely group of Steiner-inspired homeschoolers ranging from babies right up to the age of 9 in Cygnet, south of Hobart. We are really looking forward to participating in the Children Of The Valley Homeschool Group, sharing a day a week with other like-minded families and forming a larger sense of community. ~ Thursday we have swimming lessons at a lovely local private pool. We begin each day with either yoga or a morning walk, and then move into Circle Time which is a daily time of imitated songs, poems, movement, action rhymes and finger plays. This year we are introducing more focussed movement to our Circle Time. Watch beside me while I slept. We are glad for this new day. The imagination of a "zoo” is suggested to enliven the exercises. Best results are obtained when the child exercises "the animals" 10 minutes daily, or even better, before breakfast and before dinner. 1. Fish: on the stomach, chin on the floor, arms beside the body, straight legs together; the child slowly bends sideways at the waist, lifting and turning the head to look at the feet which slide to the same side, first to one side, then to the other. Three times each side. rolling with a ball held by the hands above the head. rolling with a ball held between the feet. 3. Lizard: on the stomach, chest down, head up; move legs and arms to crawl forward, pushing off with the feet and pulling with the arms, eyes looking at the leading hand. Observe the child; it is done correctly when done cross-laterally with full involvement of hands and feet. Do not correct the child to begin with. 4. Caterpillar: on the back with arms across the chest, legs bent, feet on the floor; carefully "inchworm" your way forward, pulling with the heels against the floor and allowing the lower back to arch and flatten, then back, pushing with the heels. 5. Butterfly: tie a piece of red yarn in a bow knot on the right index finger and a blue one on the left. With the eyes carefully following the hand, bring the right hand slowly backwards, upwards in a high arc and far forward, placing the hand on the floor. Bring the right knee forward and place next to the hand. Repeat with the left hand and knee, keeping the hips centred (i.e. without sitting on opposite ankle). 6. Frog: on "3/4 stomach", head to the right, right arm and leg bent forward; very slowly, one movement at a time: turn the head to the left, straighten the right arm down along the side, straighten the right leg (now flat on the stomach), bend the left leg forward, bend the left arm forward (now mirror of original position). Slowly repeat the same sequence back to the other side. Three times to each side. 7. Dog: sitting on the heels, bent forward, head down, arms extended on the floor; slowly press forward onto the hands as the head lifts up; slowly push back onto the heels as the head lowers back down. 8. Cow: helping person gives adjusted resistance against the child's shoulders, then by holding the feet from behind; the child slowly creeps forward on hands and knees. The child then creeps backwards with adjusted resistance given to the buttocks, then to the feet. 9. Crab: sitting on the floor, place the hands on the floor behind the back; lift the hips up high and "walk" on hands and feet; forward, backward, side-to-side. 11. Wheelbarrow walking: helping person (with back straight) lifts child's straight legs up; child "walks" on flat hands with fingers pointing straight forward and back straight. 12. Angels-in-the-snow: on the back, feet together, arms along the sides; slowly slide the straight legs apart as the arms slide along the floor straight out to the sides and up until the hands touch above the head. Slowly return to the original position; repeat two more times. (The legs move more slowly than the hands so the two end-positions are reached at the same time.)" "When introducing this, first we practise saying "together, apart, together, apart..." with palms coming together (on "together"), then palms to neighbours (on "apart"). This gets everyone in the rhythm of always moving their hands. When everyone can do this much, I begin passing ONE bean bag. It goes from Left Hand to Right Hand (on "Together") and from Right Hand to the neighbour's left hand on "Apart". When the bean bag can go around the circle this way (at least for a few students), I change the verse to "Give and Take..." in the same rhythm. Have the hand off from one hand to the other occur at specific words so all children are doing it together. That the baker’s man must bake. Note: Dropping the bag from the hand at chin level to the hand waiting at waist level. It should not touch the chest on the way down. I do four drops per line (on "patch", "latch", "fire", "spin", "cup", "up", "let", "in") - say it slowly. And let your neighbour in. Note: Make sure the bag does not touch the back. One drop with each line, alternating which hand is dropping and catching. Note: The bag goes in a figure eight. Tossed from the right hand, under knee of the raised left foot and caught by the left hand. Left foot is placed on ground and then left hand tosses under the knee of raised right foot. One complete figure eight (two tosses) per line. 1) Start with bean bag in the right hand, both hands held palms up in front of waist. As arms curve out and up to above the head, rise on tippy-toes. 2) Pass bag above head to the left hand and return to original position with feet flat on the floor. 3) Pass bag to right hand and slowly squat down with straight back as hands move out and down in front of the ankles, below the knees. 4) Pass bag to the left hand and return to original position, standing straight again. Note: The capitalised words are the points where the bag changes hands. Each set of two lines will take you back to starting position and doing this verse will be four complete cycles. Note: The bag makes a continuous clockwise spiral from squatting at waist level to as high as the shoulders while standing and back down. 1) Moving clockwise around the waist, pass bag to the left hand behind back while starting to rise. 2) Pass bag (in front) to the right hand At hip level (while continuing to rise). 3) Pass bag (behind back) to the left hand (while continuing to rise). (note: hands shift passing from under arm pits to passing above them). 5) Still standing, pass bag (behind back) to the left hand above waist level. 6) Begin to squat, pass bag (in front) to the right hand at hip level. 7) Squat down, pass bag (behind back) to the left hand. 8) Pass bag (in front) to the right hand at waist level (starting position). “As you (B) are big for you.” (F)"
4. jump astride for one jump alternating w/ feet crossing for one jump. These activities are especially important for children in kindergarten and the early grades. Obviously there are many other activities which children engage in throughout the day which could have them using their hands and /feet at or across the midline. As teachers and parents, we can creatively support them in this integration process." * Clap above, below, behind legs while walking, standing, and sitting. * Wrestling (magic chair, bale pit, group thumb wrestling)"
Angel of God, please watch over me. Shine like a star there above me. Lay a smooth path before me. Protect like a shepherd behind me. Be with me always, show me the way. Bless my home, Bless this day.